Advanced Optimization Systems, Inc. (AOS) has developed and implemented crew optimization programs and solutions for airlines since 1992. 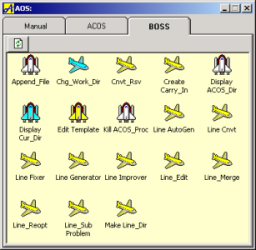 AOS is the leading provider of automated pairing and line optimization software for major airlines in North America. Crew Optimization is our only business, our strength. Our customers include small, mid-size, and large airlines. We solve pairing and line problems for regional, domestic and international fleets sized between 10 and 400 aircraft. AOS offers a complete software suite, the Integrated Crew Planning System (ICPS), which incorporates all cost and quality concerns when producing a solution. It helps our customers save millions of dollars each year without trading-off the quality of life for the crew. Our fast approach allows the planners opportunities to simulate different scenarios and provides optimized solutions for last-minute schedule changes. 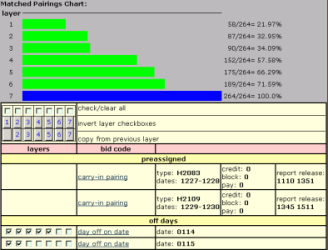 Our system is designed with tools for planners to analyze their schedules. It is automated and easy to use. Our ongoing support with dedicated personnel is first class. Currently 6 airlines use our products. We support over 30 users, operating under 10 different labor agreements and interface to 6 different crew management systems. We have trained users at different locations and our experience allows us to confidently build implementation plans. Customers immediately see the benefits of our optimization technology. With our cutting-edge technology and integrated system, AOS provides a complete crew optimization solution that meets complicated airline operations of today and tomorrow. AOS offers a complete product suite, the Integrated Crew Planning System (ICPS), to resolve the crew planning challenge. All products are completely integrated. 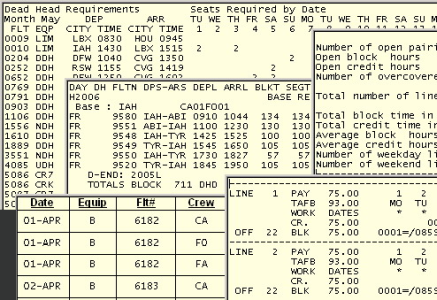 Starting with marketing schedules and manpower requirements including positions and languages, the ICPS solves the pairings optimization problem, constructs lines conforming to either traditional Bid Lines or Preferential Bidding, generates reports (hotel letters, meals, limo pick-ups, deadhead reports, etc.) and loads the solutions directly into the customer's existing crew management system. All of products run on Microsoft Windows ® based desktop, notebooks, and servers. 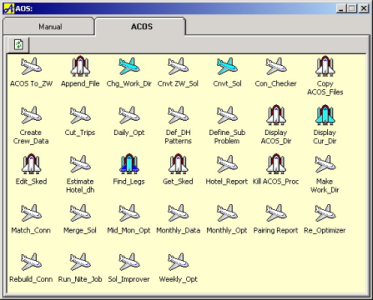 As the most widely used pairing optimizer for solving large-scale crew planning problems in North America, ACOS delivers unparalleled performance from a personal computer. Its sophisticated yet efficient algorithm takes a Global Optimization approach and produces high quality pairing solutions that meet government and contractual requirements as well as constraints set by the crew planners. Since its first installation in 1992, ACOS has incorporated most of the work rules and essential requirements from the airline industry. Its performance, flexibility and ease of use assure the most cost-effective and high quality results to our customers in any type of economic cycle. The APBS is a web-interfaced preferential bidding system using proven technology and innovative breakthrough algorithms. It utilizes Global Optimization to achieve the highest overall crew satisfaction, control open time while guaranteeing seniority. The system generates a huge number of preferred legal lines for each crewmember, and selects a global solution which maximizes the overall crew satisfaction and company goals. This solution is then used as a guideline to select the best fit from the best lines for each crewmember in seniority order. No other approach comes close to achieving similar results. With BOSS, AOS has implemented Global Optimization which gives planners the flexibility to build the kinds of lines they want. 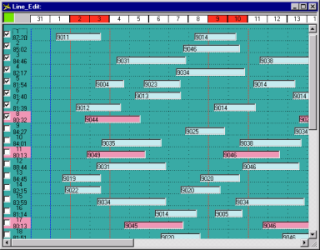 The planner can control line quality (turn trips, weekend-off trips, number of off-days, report times, pairing types, cadence, etc) and their distribution as well as line averages while covering all pairings. Once the planner has determined the desired qualities and targets, the strategy can be saved into a template, and then used for an auto generation process. 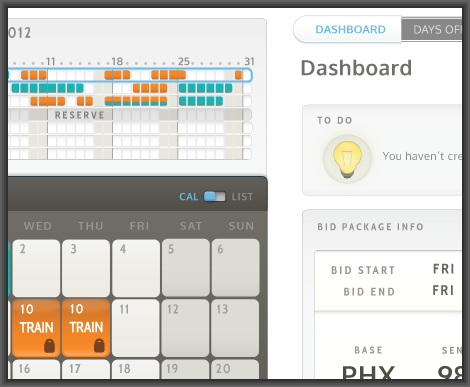 It offers choices of different kinds of pre-built bid lines for crewmembers that traditional bid line generators can never offer. The Pairing Editor is a graphical tool used for viewing and editing pairing solutions. The colorful and detail oriented point-and-click editor lets users visualize pairings and open them in a calendar for further editing. 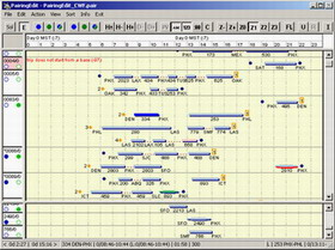 The editor can also compare the solution against a different schedule and automatically repair pairings due to schedule changes. During editing, the legality of the pairing is determined immediately and if there is a violation, an error message is shown. The Pairing Editor delivers sophisticated functionality with ease of use. The Reserve Line Generator utilizes AOS's proprietary optimization algorithm, automatically creating minimum Reserve Lines. These Reserve Lines are based on the exact crewmembers needed at each calendar date, inputted by the user, while honoring the company/union reserve line rules, such as total on-day per line, maximum work-block-day, minimum off-block-day, and golden off-day. In addition, the user may specify the preferences to guide the optimizer to generate as many preferred patterns of minimum Reserve Lines as possible. The Report Module is integrated with AOS's Pairing and Line Optimizers to create crewmember readable hard copy reports according to the customer's specified format, which can be adapted directly in each month's bid packages. In addition, it reads pairing and line solutions to generate consolidated information for hotel letters, meal schedules, limo pick-up schedules, and deadhead reports for all fleets, domiciles, and layover stations based on the specific logic provided by the customer. The result can then be sent to a printer or loaded onto a website. East Brunswick, New Jersey 08816-4909, U.S.A.
"Once again you have shown America West that AOS is truly a company of professionals that are dedicated to their customers and willing to take quick action to help resolve problems in time of need. Thank you all." - Mark Rhodes, Sr. Specialist-Crew Planning and Analysis, America West Airlines. "We have had the ACOS in operation for approximately 4 years (since 2001), and they have performed exceptionally for us from the beginning. We value the close relationship we have developed with AOS, and greatly appreciate the help provided by them as our operations have changed and evolved into where we are today..."
- Juan P. Norat, Sr. Analyst, American Eagle Airlines. "The AOS Pairing Generator and Bid Lines program gave Continental the speed and flexibility to not only reproduce HIGH QUALITY pairing and line solutions in a matter of days, but also the ability to do feasibility studies during rebuilding process. AOS gives Continental the ability to respond to change, whether it is from a schedule adjustment or a contractual change." - Todd Brain, Manager-Crew Planning, Continental Airlines. "AOS enables us with the ability to produce efficient and accurate pairing solutions quickly, thus allowing for the necessary 'tweaking' needed for our unique domicile and route structure. AOS has been a welcome and essential software addition as we have grown and continue to grow into a more complicated, larger airline. The Pairing Editor has also proven itself to be a very useful and essential tool. The editor provides a graphical image of the pairing solution that makes editing and moving legs quick and easy. We would not be able to complete our schedule without this wonderful tool. We also feel as if the support staff at AOS is family and held in high regard. They are more than willing to help us through any change and/or difficulties we have experienced in the past 2 years." - Trisha Chamness, Crew Planner, SkyWest Airlines. "And again, I wish to thank you both (and all of AOS) for your patience and help. You have been so very kind and helpful to me and I do sincerely appreciate and thank you. We have faced some tough issues here in the past several months and you have certainly gone well above and beyond the call of duty to help us. I look forward to working with you in the future and I am excited about the possibilities your software offers us in building better schedules for our crewmembers. You guys are great!" - Karin Henry, Manager-Crew Planning, Atlantic Southeast Airlines. "I enjoy the flexibility of the AOS system. I started with the same marketing schedule then manipulated a few cost-saving "tweaks" to demonstrate some scenarios. Amazing how quickly the answers come back! With AOS I was able to present pairing solutions, fully cost out and optimized, less than 24 hours later." - Stephen Siracusa, Crew Planner, Air Wisconsin. "There are many crew pairing optimization systems to choose from. AOS uses the newest global algorithm techniques to produce the lowest cost solution. What sets AOS apart from other software providers is their excellent customer service. They treat you like family versus a problem they have to deal with. The implementation of the software was on time and seamless." - Karen Biesiadka, Manager-Crew Planning, Alaska Airlines. As a software product provider, with the goal to promote our products, AOS offers free benchmark test runs based upon prospective customer's flight schedules. The benchmark test runs include pairings, lines (Bid lines or PBS), and reserve lines. The results will be provided with AOS standard readable reports detailing information of pairings and lines, as well as statistical information. It is also possible to have the results in electronic formats, which allows a prospective customer to upload the pairings and/or the lines to its existing crew management system. Prospective customers can compare the results with its own or other vendor's to justify the project with us. AOS's Benchmark test runs may be performed in front of planners at prospective customer's office, our customer service office, or through web online meeting. In this way, the planners will have a clear idea how our products solve the problems. We also offers a demonstration in a test environment ( with test schedules, test bids, test rules, etc). Prospective customers may have an overview of our products without the effort of preparing any test data. There is no cost, no commitment or any obligation needed for the benchmark test run. All of our products are ready to deliver and can be purchased or leased. Short-term production-run service is also available. Once a prospective client becomes our customer, under maintenance contract, AOS offers free updates of the software and free technical support with dedicated personnel. We offer two major implementations of new rules per year at no additional cost. The same rule with different values is not considered a new rule which can be defined by the planner him/herself. Most customers never need to implement new rules. Almost all the rules have already been developed and programmed for use. © 2013 Advanced Optimization Systems, Inc.